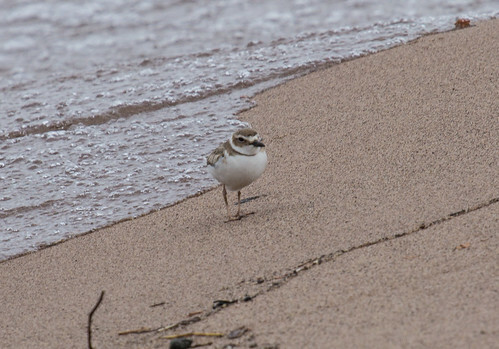 Thirty-one years ago, on May 15, 1982, a Wilson’s Plover turned up at Park Point in Duluth and remained for a few days. 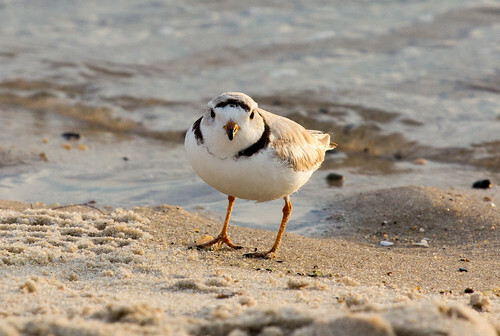 This plover, smaller than a Killdeer but larger than a Semipalmated Plover, with an oversized black bill, is strictly a coastal species, found along the shores of the southern Atlantic and the Gulf Coast. 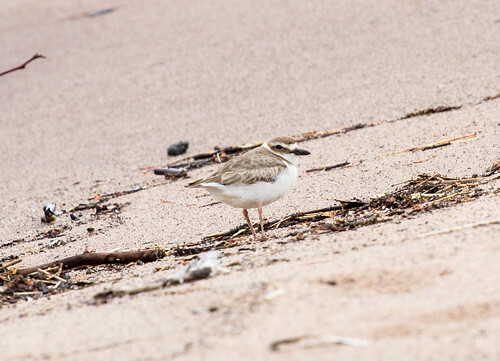 Over 95 percent of a Wilson’s Plover’s diet is fiddler crabs, so one wouldn’t expect to find the bird on the Great Lakes, and sure enough, this marked only the second time ever that the species had been reported in Minnesota. 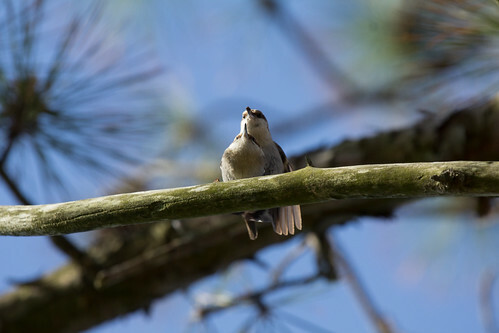 This was before the Internet and even a bit before telephone hotlines, so I didn’t hear about the bird until two days after Larry Weber first found it, when my friend Tim Lamey got the word out and I hightailed it over there. It wasn’t a lifer—I’d seen several Wilson’s Plovers along the Texas coast a couple of years before—but I was hell-bent on bringing my Minnesota list up to 300, and am inordinately fond of plovers anyway. If I recall correctly, this bird had an injured leg, so I was worried about it on two counts, but was nevertheless thrilled to have seen it. 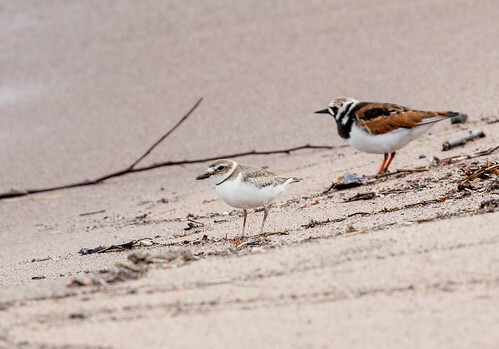 That was the last Wilson’s Plover to be seen in Minnesota for over 31 years, until May 27, 2013, when Karl Bardon found one on the Park Point beach just beyond the airport hangers. The bird remained for at least several hours, giving a lot of us enough time to get over there and see it. It probably felt rather lost and bewildered on the shores of a freshwater lake with no crabs to be found anywhere. But the flock of Sanderlings and Ruddy Turnstones it was hanging out with probably made it feel a little less like a stranger in a strange land. 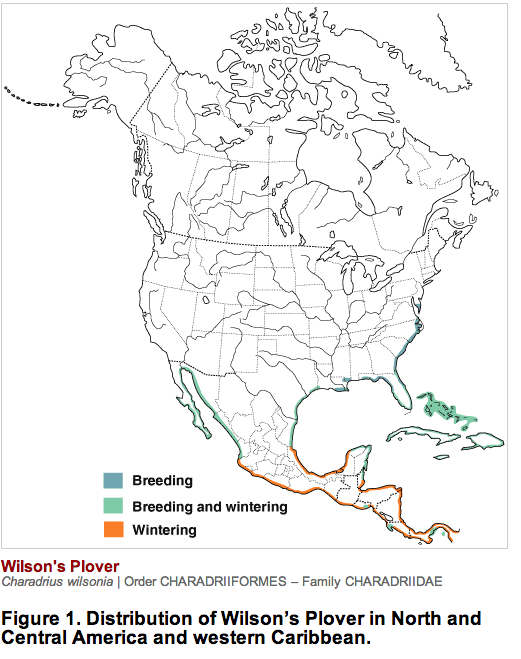 Wilson’s Plovers are one of many declining shorebirds ranked as species of high concern in the United States Shorebird Conservation Plan of 2001. 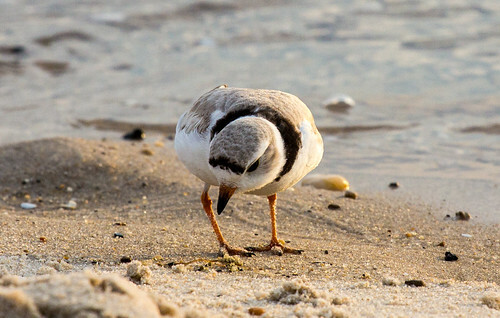 Laying their camouflaged eggs in little scrapes on sandy beaches as do Snowy and Piping Plovers, Wilson’s Plover is vulnerable to even moderate human activity during the nesting season. As the human population grows and we get more and more crowded, a handful of people seem to be acting out their resentment of any restrictions whatsoever on their beach activities. Indeed, when I was out on Park Point, I asked three different dog walkers if they wouldn’t mind heading the other direction to avoid scaring off this very rare bird so it could rest ahead of an arduous journey back to the coast, and also so that the many birders arriving on Park Point would be able to see it before it moved on. Two of them very nicely said it was no problem, but the third gave me an annoyed look and said he’d maybe keep his dog on the leash but wasn’t going to change his route to accommodate a bird or a bunch of birdwatchers. 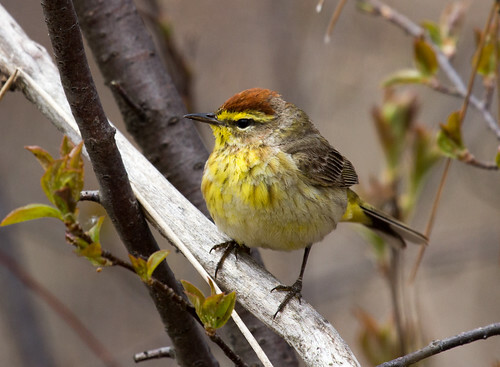 Most people conscientiously do their best when alerted to this kind of exceptional situation, but it only takes one thoughtless step to crush a ground nest and destroy a pair of birds’ only chance of reproducing for an entire season, and it only takes one beach-running dog to deplete the energy of an exhausted bird lost on migration. I’m tired of people saying birds can fly off to other places, because the simple truth is all those other places are equally under siege by people. 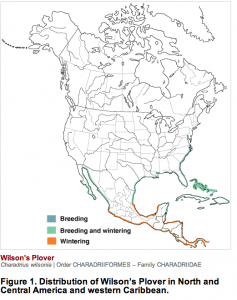 There are so few inland records of Wilson’s Plovers that we have absolutely no way of knowing whether it’s possible for the bird to make it back to its Atlantic coastal range. All we can do is hope. 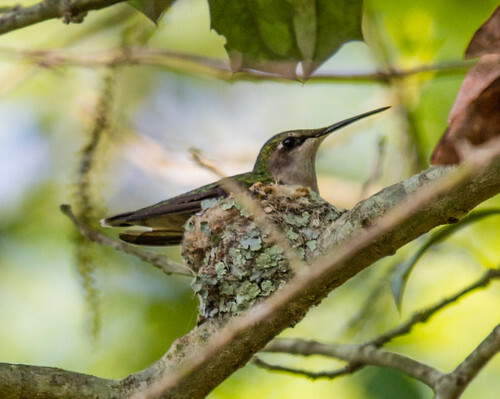 One bird doesn’t make much difference at the population level, but its individual life is irreplaceable. I hope this one Wilson’s Plover finds its way home to a feast of fiddler crabs, bringing lots of stories to share with its less adventuresome fellows. This entry was posted in Uncategorized on May 28, 2013 by Laura Erickson. I’m having a great time this year, as I try to see as many birds as I can. I’m of course focused on getting a big year list, and on seeing some birds I’ve never seen before, but I’m equally interested in seeing old friends again and again. As a matter of fact, some of my most treasured experiences of the year have been with common species I’ve already seen dozens, hundreds, or even thousands of times. 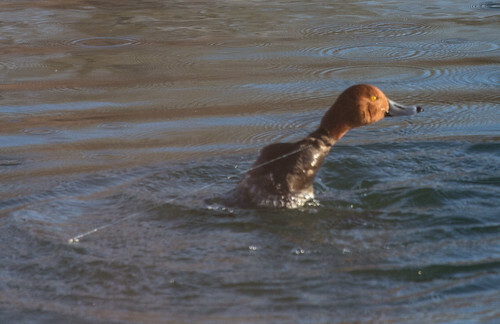 In Colorado, at the Pueblo Reservoir, we saw a gorgeous male Redhead entangled in monofilament. He struggled for a good ten minutes while we watched in dismay. 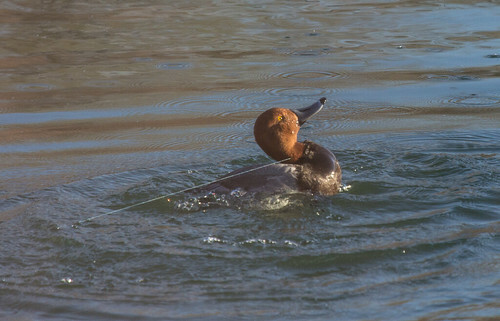 It was impossible for us to rescue the poor bird, and usually entangled birds get so desperate to free themselves that they make things worse. But this one somehow managed, in a dive, to pull out of it, and swam off good as new. I was thrilled beyond words. 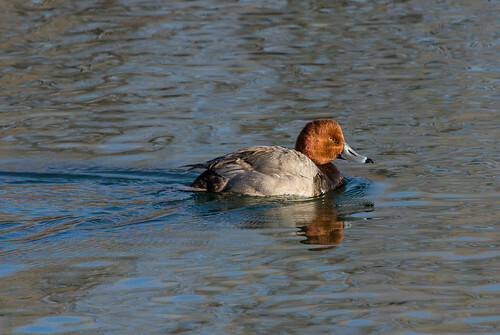 I’ve seen a lot of beautiful Redhead drakes in my life, but none so beautiful as this one. 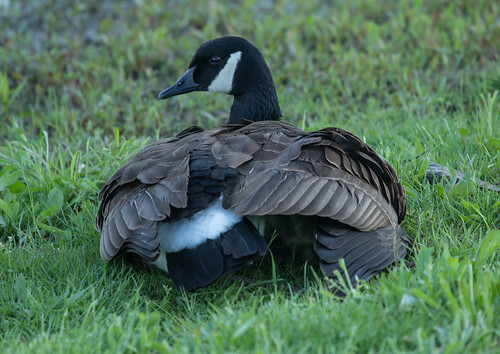 One cold afternoon in Delaware, I watched a mother Canada Goose who had hunkered down and held her wings out in an awkward pose, keeping her goslings warm against her body and sheltered against the wind. Her mate stood watch, and when he raised his head to look at me, I stepped back to keep from alarming them. Every single bird we see was raised by parents who did what they could to keep their young thriving, and Canada Geese are not merely abundant but actually too plentiful, but I treasured seeing this wonderful pair. 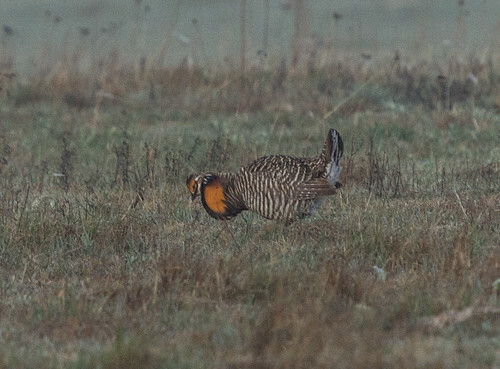 I’ve watched Greater Prairie-Chickens several times over the years, but the lone bird I saw while I was in Kansas near the Cheyenne Bottoms captured my heart. He was cackling and dancing and booming, with no males or females anywhere around to see his amazing performance. 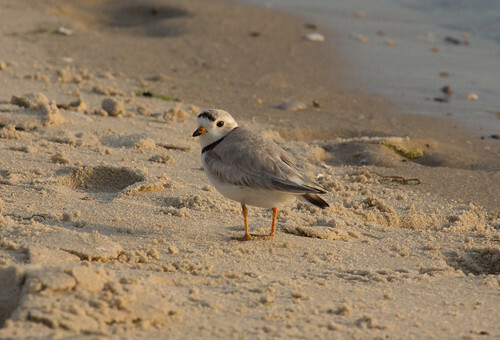 The beach at Cape Henlopen State Park is the only place in all of Delaware where Piping Plovers breed. I did a Big Day as part of a team participating in Delaware’s annual Birdathon, and Cape Henlopen was our last stop of the day. Piping Plovers breed in a fenced-in, closed-off part of the beach, and were easy to see from a distance, and when we went down on the public beach, two Piping Plovers were strolling about right in front of us! I spent 10 or 15 minutes photographing them while everyone else scanned the ocean for new birds. When they yelled out “Surf Scoter!” and “Red-throated Loon,” I stepped over to the scope long enough to add them, but instantly gravitated back to the lovely little plovers. They are endangered, and so I’ve not had nearly enough opportunities to see them over the years, but any moment with a Piping Plover is a moment to treasure forever. 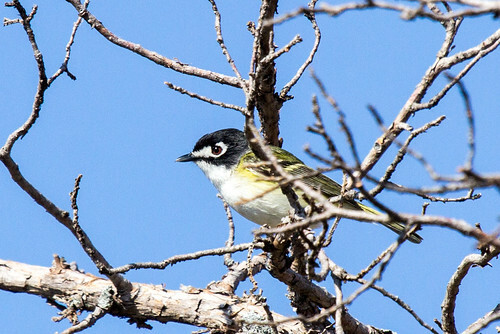 spending a while day watching one young male Black-capped Vireo establishing his territory. 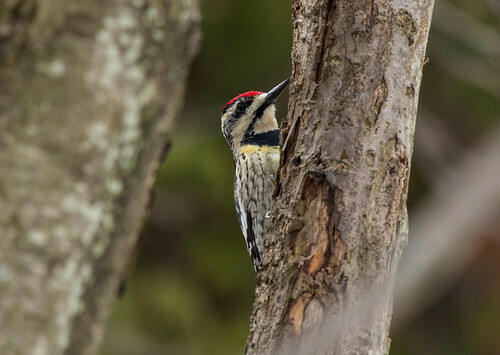 While I was home in April, I spent 20 minutes watching one gorgeous male Yellow-bellied Sapsucker drilling little wells in an aspen and lapping up sap. All these little moments are adding up to a tremendous year. I’m doing my best to keep my field notebook up to date, and to keep my photos labeled by place and species and behavior. I’ll be able to pull out lovely memories on dark days for many years to come.